In the early hours of a week day morning, a retired man from North Carolina crossed the center line and collided with an SUV, first grazing a tractor trailer and then hitting the SUV straight on. Both the man and driver of the SUV died at the scene of the accident. The man was driving the wrong way on Interstate 26, and it is believed that he was confused about several things, including his direction of travel. The driver had been experiencing several health problems prior to the collision and may have left early to go to a doctor’s office. The sudden death of a loved one leaves family members with a lot of financial strain on top of the natural grieving process. Car accident deaths, like the one described above, can leave family members scrambling to find money for funeral expenses, medical expenses (if the family member was seen by a doctor after the accident, prior to the death), and household bills. Finding compensation that you might be entitled to under your family member’s policy to help relieve some of the financial burdens can become a difficult process. Insurance adjusters may offer a quick settlement to a family member during this vulnerable time, and the full compensation that would be owed under the policy may not be awarded. In North Carolina, automobile insurance policies offer compensation for bodily injury and property damage under the mandatory coverage. If the person who caused the accident was negligent, then the injured person or the family members of the the deceased can file a claim against the at-fault’s insurance policy. If the at-fault’s party does not have insurance or the coverage available fails to meet the expenses, then the injured or deceased’s policy can possibly be used. Uninsured or underinsured motorist coverage may be available, depending on whether the policy holder kept the mandatory uninsured coverage. A possible challenge is if the deceased is found to be partially negligent in any way. North Carolina follows the legal concept of contributory negligence, which completely bars recovery if the party seeking damages is negligent in any way. Other states follow a much less severe precedent called comparative negligence. Under that legal theory as long as the party filing suit is 49% or less negligent, they can still recover from the other party. However, the amount of damages may be reduced by the percentage of their own negligence. Herbert and Arlene Auger are North Carolina Personal Injury Attorneys who practice across the State of North Carolina, fighting aggressively for clients who have been injured or had a family member killed as a result of an auto accident. 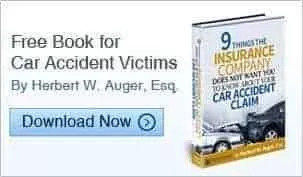 The attorneys of Auger & Auger know how to negotiate with insurance companies and litigate injury and wrongful death cases so your compensation is maximized. If you have been injured in a car accident or have had a family member killed because of an auto collision, then call our office at 888.487.0835 for a free, confidential consultation. Last month on the Northeast Cape Fear River two john boats collided, ripping one of the boats to pieces. One woman died and another man, who was later determined to be her boyfriend and father of her children, was severely injured. The man was recently charged with involuntary manslaughter due to his impairment while driving the boat. Reports indicate that he had drugs in his system and a blood alcohol level of .09 two hours after the accident. North Carolina has made it illegal to boat under the influence of drugs or alcohol. You cannot operate a boat with a blood alcohol concentration level of .08 or greater. Violation of the law carries a misdemeanor punishment that can include up to 60 days in jail and a $1,000.00 fine. Skiing and surfing while impaired is also illegal. By making it a crime to operate a boat, ski, or surf while impaired, the North Carolina legislature has made it clear that people who participate in these activities owe a duty to others to perform them safely. Failure to live up to this duty creates liability for the owner or operator of the boat, and they can be responsible for the damages the injured or deceased loved one’s family incurs. The North Carolina Wildlife Resources Commission published a set of findings for the Boating Accidents and Fatalities of 2012. 151 boating accidents were reported, with 23 of those accidents listed as fatal. 95 total vessels were involved, and 96 people required medical attention. Different activities were occurring when the fatal accidents took place, including changing speed, changing direction, fishing, drifting and cruising. Cruising and maneuvering were the top two activities for non-fatal accidents. Operator inattention was the number one cause of non-fatal accident, with careless/recklessness listed as the 3rd cause. Almost half of the fatal and non-fatal accidents involved people who had no education in boating safety. This data highlights the contributing factors to boat accidents, and provides some incentive to put cautionary measures in place to avoid collisions and injury. North Carolina is a contributory negligence state, which means that if the person filing the suit is negligent in any way – even as little as 1% at fault – they can be barred from recovery. Thorough evidence obtained quickly after the boating accident can help prevent any counterclaims of contributory negligence. Evidence located at water-related accidents can easily deteriorate, and quickly securing objects, names of witnesses, and photographs of the area can greatly aid a boating accident negligence case. The North Carolina boating accident attorneys at Auger & Auger are experienced personal injury lawyers who are familiar with the intricacies of maritime and admiralty law. Both Herbert and Arlene Auger are avid boaters and certified scuba divers. They have a deeper understanding of boating and water-related activities, and how they intersect with the law. If you’ve been injured in a boating accident, contact the experienced lawyers of Auger & Auger today at 888-487-0835. In Raleigh, North Carolina an elementary school child was pulled from the apartment complex pool by emergency officials after they received reports of a drowning. The boy had been swimming with his friends, and emergency workers attempted to resuscitate him before taking him to the hospital. There was no lifeguard on duty. The boy died the next morning at a university hospital. North Carolina has a lot of tourist attractions and athletic facilities that provide swimming pools to guests and members. Several residential facilities, like the apartment in the story above, also offer indoor or outdoor pools for residents and guests of the residents. While a great pastime during the hot summer months, swimming pools and other bodies of water can readily become a dangerous environment for those who use them, especially children. According to the National Center for Health Statistics (NCHS), drowning is the second most common cause of injury death for children age 5 and younger in the United States. A recent study published by Pediatrics, found out that around two-thirds of pediatricians, family physicians, and pediatric nurse practitioners who serve families with young children in Los Angeles County did not know that drowning caused more deaths among children than ingesting toxins or using firearms. This study shows that even medical professionals are unaware of the extensive risks that drowning poses to young children. The North Carolina Administrative Codes (NCAC) thoroughly outlines the safety features pools must have for public use. Some important requirements include the placement and location of depth markings (for minimum and maximum depths), the placement of signs like “no diving” or “no lifeguard on duty”, and the use of artificial lighting for pools open at night. Public pools are supposed to be enclosed by a fence, wall, building, or combination of the three to avoid accidental drownings of those who could not tell a swimming pool was present. The more communication there is of the pool, its depth, and how to get out, the safer the experience will be. Life saving equipment shall always be available in case an emergency does occur. All institutions that provide public pools must follow these safety guidelines, as they are under a duty to provide safe premises for those they invite onto their property or reasonably expect, like guests of those who live in a residential complex or are members of the club with the pool. Failure to provide safe premises creates liability for the owners of the pool and property if their negligence results in injury or death. The North Carolina Personal Injury attorneys, Arlene and Herbert Auger, have over 40 years of combined experience negotiating and litigating on behalf of injured clients. With several 6-figure settlements under their belts, they know how to maximize the compensation you are entitled to and need for your living and medical expenses. If you or someone you know has been injured in a swimming pool or drowning accident, contact one of our skilled attorneys at (888) 487-0835 for a free, confidential consultation.